Robin Shroot came into the pro game later than most of his peers but despite only being in full time football for nine years, he has collected more knowledge than most. He has experience of playing football at many different levels. From battling out in non-league football to playing at the highest level of football in Norway to now featuring for a brand new club in America. They have all equally shaped him into the player he has become now. The 30-year-old forward is a deep thinker. His responses to my questions cover topics ranging from the personality of footballers, the culture of football in America and finances. Even recalling the moment his dream of becoming a professional was realised is analysed. Having started his career at the old Wimbledon, Shroot then joined Staines Town as a 16-year-old before returning to Wimbledon to join the new AFC phoenix club. It was at his next club, Isthmian League Premier side Harrow Borough, where he would catch the eye of professional clubs and after a trial, he signed a two-and-a-half year deal with Birmingham City in January 2009. Loan spells at Walsall, Burton Albion and Cheltenham Town then followed before the forward left Birmingham permanently to join Stevenage, having made just one appearance for the Blues. After nearly three seasons in League One with Stevenage, Shroot wanted a change. Fortunately, two Englishmen at a club in Norway would offer the former AFC Wimbledon man the lifeline he wanted. “I still had time to run on my contract at Stevenage, though I had become disillusioned with football and things that I had experienced within the game,” he says. Former England international striker Deane was in his second season in charge of Sarpsborg and had brought over young coach Burchnall with him. The latter had previously worked at Leeds United and Bradford City and would go on to play a big part in Shroot’s Norwegian adventure, although he wouldn’t play for him at Sarpsborg. The Norwegian side Shroot would eventually join was second tier club Hødd based in the town of Ulsteinvik which has a population of just 6,000. He definitely did enough in his first season to keep those few locals excited, though. In his debut season, the forward hit 16 goals in just 23 games as he finished as the second top scorer in the league. His goals were not quite enough to earn his side a promotion playoff spot but he had made a big impression in his new home and he is certain on why his first spell with the club was such a success. “Sometimes, values of people align, people and managers are able to look at you and appreciate your talent better than other managers have and an environment is better able to get the best out of you because they make you feel at home, valued, and that you are making a difference. “I was made to feel all these things [at Hødd], though I had a responsibility on and off the pitch to use my experiences to help the club and others around me. This is a massive thing for me and something which isn’t communicated enough in the modern game. Too many clubs only see players as players and don’t value them as people. 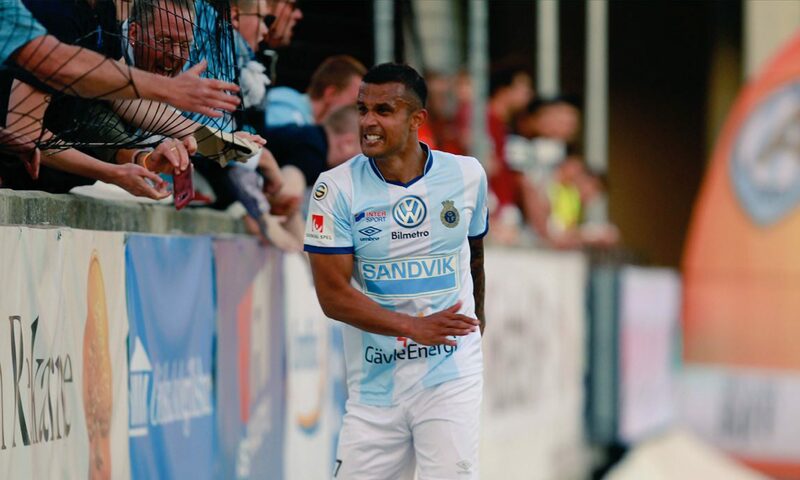 The following season, Shroot joined newly relegated side Sogndal for the 2015 season before returning to Hødd halfway through the campaign. The following season, he was back to his best, scoring 12 times. However, although successful on a personal level, his side would be relegated that season. Although disappointed about his side’s demise, it led to a reunion with Burchnall. The young coach was now in charge of top flight side Viking, historically one of the biggest clubs in the country. A loan move soon followed and Shroot finally had his chance in the top flight. He would go on to make just six appearances that season but he does not see it as a wasted opportunity. “Whilst I didn’t play much at Viking, to be part of a massive club with such a proud history was a privilege. His season with Viking also meant three years on from their original contact, Shroot finally had the chance to play under Burchnall, someone whose own career has gone from strength to strength lately. The English coach currently manages Östersunds after taking over from Graham Potter. “Burch is extremely knowledgeable and has a passion for what he does,” says the forward. “His training sessions are brilliant fun however, highly educational, and this is what you want as a player. To be stimulated every day rather than just doing the generic, do what everybody else does training. After his year in the Norwegian top flight, his time in Scandinavia came to end as he headed for an entirely new environment, a polar opposite in terms of climate. “I played for Gary Smith who was manager when I was at Stevenage. He was given the task of building a new franchise at Nashville Soccer Club and got in touch early in 2017 to discuss whether I would like to come and be part of something new. So at the end of last year, the 30-year-old became one of the club’s first ever signings. He was recruited alongside several others, including the Isle of Man’s Liam Doyle, to be the first group of players ever to represent the new club in America’s second tier, the USL. Being part of something so new was a unique experience for the former Birmingham City man. Heading towards the end of the regular season, Nashville currently sit in in seventh place in the USL Eastern Conference and with just one game left to play, it looks like they will make the end of season playoffs. Shroot has had his game time limited to just eight appearances so far in all competitions, scoring once in a US Open Cup win over Mississippi Brilla. Despite that, he has noticed some big differences in the football in the States compared to Europe. Even though he has only been in the country for a year, there are also some much bigger differences in the States compared to the UK when it comes to youth football, something the forward is keen to explain. “People have to understand that the football culture here is not like it is back in Europe or other parts of the world. The immersion in the game from a young age; the knowledge, football intelligence, tactical intelligence, for example, is so hard to compare because the understanding of the game is so different. It is clear from this that Shroot is ready to pass on his knowledge to future generations just by how much he has learned from his short time spent across the Atlantic but this does not mean he is ready to hang up his boots yet. “I still harbour huge ambitions as a player, and want to play for as long as I still love doing so.